Our Minibus Hire Reading has a large fleet, with several 33-seater vehicles in the mix. The 33-seater coaches are mid-sized coaches, capable of accommodating medium to large groups, with their luggage. It perfectly suits the requirements of tour groups, event planners, schools, colleges, church group, and others. These coaches are mostly availed for making sightseeing trips, transporting guests for weddings and other events, and for a host of other purposes. There are several reasons why our 33-Seater Minibus Hire Reading coaches are always in high demand. Our vehicles offer the ultimate in luxury. It spots strong air-conditioning, the latest music systems, comfortable push-back seats, overhead LED reading lamps, drinks fridge, and more. The vehicle also comes with advanced safety features, such as hands-free operations for controls, anti-collision warning, automatic headlamps, and more. Our superior vehicles are backed up by excellent service. Our ever-responsive customer support team works round the clock, and attends to all your requirements, promptly. 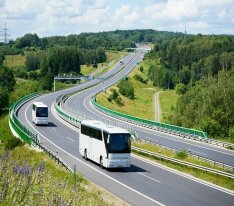 The drivers, who come with the coach hire services, are not just highly competent, but also trained to handle the vehicle properly. Reliability is our key strength, and we always strive to delight our customers in everything we do. Our 33-seater minibus, like the rest of our fleet, costs the lowest, compared to the rates charged by any other operator. We offer transparent pricing, with no hidden charges.